Review for Costco GTS Organic & Raw Gingerade Kombucha. 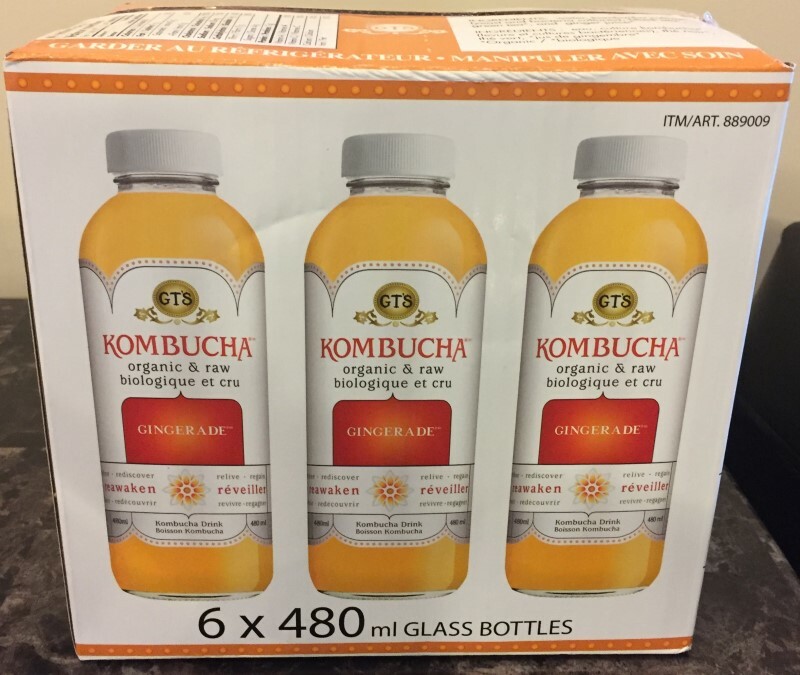 Is anyone else curious about the currently popular GTS Organic & Raw Kombucha at Costco? Hi, It’s Natalie from costcuisine.com with another review! Costco West generously lets me post a guest review here, but if you want to read more reviews or see some Costco recipe ideas, please check out my website or follow me on social media! There has been a lot of talk about Kombucha recently, particularly the health benefits people gain from drinking it. Kombucha has actually been around for a really long time and is most famous for improving gut health. I had to do some research to find out what Kombucha actually is so I could share that information with you. 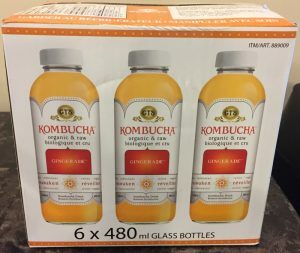 Costco’s GTS Organic & Raw Kombucha is basically fermented black and green tea as well as enzymes, so like other fermented food it is full of healthy probiotics. It also contains polyphenols, active enzymes and amino acids (things that help healthy digestion and are good for your stomach). A lot of individuals with digestion issues claim this has really helped them feel better and improved their overall wellbeing. The articles I have read on Kombucha claim it can boost energy, speed healing, reduce glucose levels after a meal, prevent cancer, improve arthritis and inflammation, reduce risk of heart disease and even aid in weight loss. I’m a food reviewer, not a scientist, but I wanted to provide some background information! 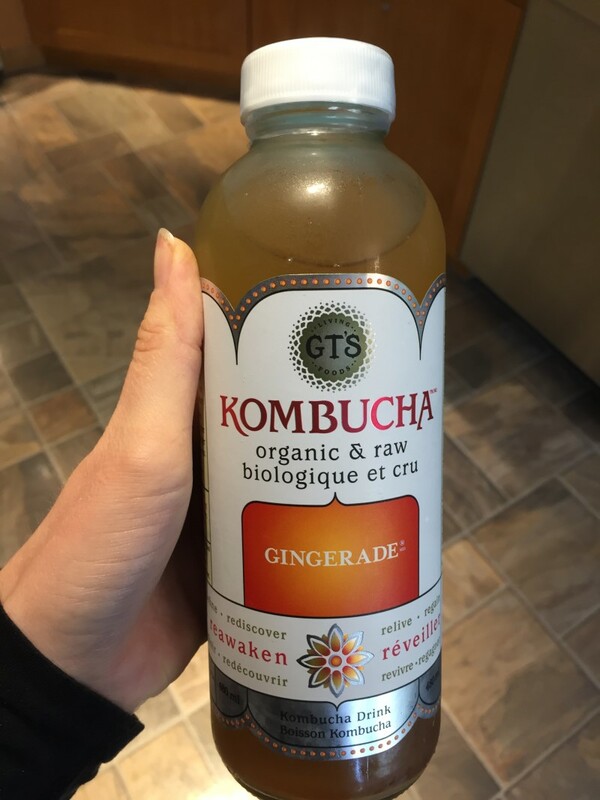 GTS Organic & Raw Gingerade Kombucha bought at Costco is not cheap. I have coworkers that have decided to replace their morning coffee with Kombucha since it has caffeine. If your morning coffee is usually $3 to $5, then I suppose doing that would offset the price, but for me this was definitely a more expensive purchase. I purchased these at Costco for $18.99 Canadian (which is full price). For $18.99 you get 6 bottles that are 480 ml each. I also had to pay a deposit which added to the cost. Not cheap. If I could buy these on sale I think I would feel a lot better about the cost. At farmers’ markets and smaller specialty stores, Kombucha can either be cheaper or less expensive than Costco; I’ve seen it at prices ranging from $3 to $7 dollars per bottle. Based on that, Costco is possibly a cheaper option for purchasing Kombucha, especially if it is on sale. In brief there are a ton of claims about the huge health benefits related to drinking Kombucha. 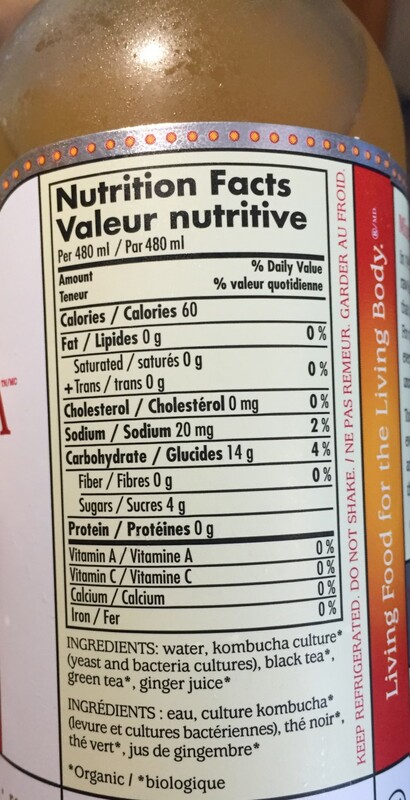 Nutritionally each bottle has 60 calories, 0 grams of fat and 4 grams of sugar. The ingredient list is super short: water, Kombucha culture, black tea, green tea and ginger juice. If you were thinking about replacing your morning iced frappuccino with this, it would be a healthier option, but it still does have sugar from the ginger juice. If you are pregnant, breast feeding or not able to have caffeine it’s recommended that you do not consume Kombucha. The tea comes in a sealed box that has separations in the box to protect each bottle. Basically you just swirl the tea a few times to mix it up and drink it (side note: do not shake it as it will explode). The tea is convenient in the sense you don’t need to add anything to it. However, the box is quite heavy and large which makes it less convenient. It comes in glass bottles that are heavy and more prone to breaking. Also, there is an expiry date on the box (about two months), so if you’re like me and leave things in your fridge for extended periods of time before consuming you may want to think twice before spending 20 dollars on a case. GTS Organic & Raw Gingerade Kombucha tastes very gingery, so if ginger is not your thing, you probably won’t be in love with this. This definitely does not taste like a soda or a sweet juice. It is a “live” beverage so the bottles had a few live active culture floaters in it from the bacteria culture. It is quite fizzy, not very sweet at all, just a slight sweetness from the ginger juice. It tasted more like green tea than black tea to me. It definitely has a little bit of acidity and a slight vinegar taste. Overall, it’s actually quite refreshing because it isn’t sweet. I think it’s always fun to be adventurous and try new things! Overall I probably won’t purchase this Kombucha again. I didn’t love the taste and I have a hard time justifying the cost. 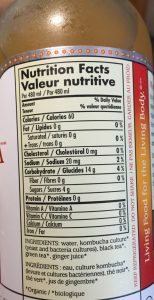 I didn’t notice numerous increased health benefits personally (other than increased energy after consuming, most likely from the caffeine. I generally don’t have any digestive concerns, but if I did I would definitely consider committing to drinking a bottle a day for at least two weeks to see if my condition would improve. I think I would prefer a mango or raspberry flavored Kombucha as ginger isn’t my favorite, but if you like ginger and have gut health concerns or just want to be adventurous, I recommend trying this! The taste was fine and for 60 calories it is a refreshing, fizzy beverage that makes you feel like you’re doing something healthy for yourself. Have you had Kombucha before? Do you like it? Anyone notice the health benefits from it? 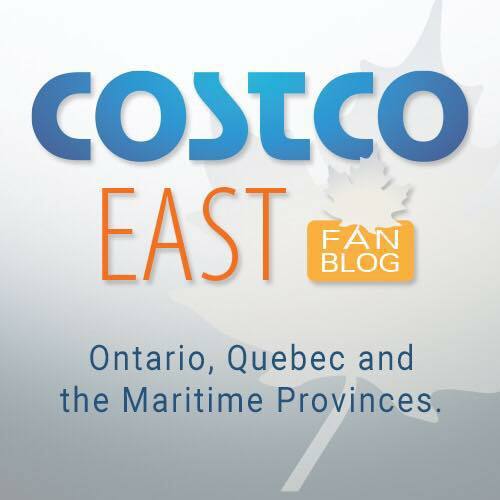 To see more Costco food reviews check out the Costcuisine blog! If you like a little heat in your salad you might like this! Did you know it is easy to make? How do u make it? Easy to make at home. In fact the scobi grows out of control. Tea is cheap. Manufactured Kambucha is extremely overpriced and I stopped buying it for that reason. Make your own then you can add any flavour you like. I love this brand of Kombucha as well as this flavor. It does remind me a bit of ginger ale. They do sell other flavors at Superstore which you can try. I like to have a bottle when I get home from work just to give me a little boost. There’s a reason why this particular flavor goes on sale. Even if you like Ginger as I do, I really dislike this combination. I prefer the other Kombucha variety pack. It’s really good but at $16 regular price, it’s quite pricey. Making your own may sound easy BUT you need special bottles, you need to sterilize them and after bottled, it can explode! But health benefits were and are my main reason for justifying the purchase price. I’ve had to deal with a Candida (yeast) overload after needing to be on antibiotics for an extended time. It was great for helping me replenish my good gut bacteria and get my system back to normal. I have been drinking this Kombucha for a year now and love it! There is no price consideration if for your health. It does settle the tummy and helps with digestion. For a little over $2.00 a bottle it is well worth it. When on sale I buy 4 cases. Even my 95 yr old Dad likes it! I also don’t prefer this flavour – this brand has many flavours, so I hope they get others in at some point. Even at $3/bottle, it is much cheaper than buying at a grocery store, even on sale. The other brand (Brew Dr.) is cheaper and comes in 3 flavours that are much nicer. I drink about 1/2 a bottle in the morning on an empty stomach and I’m sure it helps with my digestion. It’s also a nice alternative to pop or juice for someone avoiding alcohol for any reason.